Trade in the grey city pavement for the vibrant colors of Hiawassee, Georgia. Come see this scenic Georgia mountain property for sale. Choose from championship golf, hiking, fishing, water sports, horseback riding and just about any other outdoor activity you want. 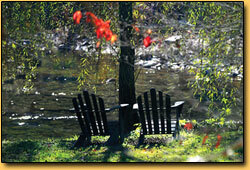 Enjoy arts, crafts, antiquing, concerts, fairs and festivals. From charming cabins to full service conference resorts. Some of the best golf courses in the entire state of Georgia, as well as some of the most challenging, can be found right here in Towns County. North Carolina's Clay County, only minutes away, is also a destination point for golfers. Description: Brasstown Valley Resort Golf Club features a 7,100 yard Scottish links-style course with water coming into play on ten holes. Consistently ranked as one of Georgia's top places to play, the par 72 18-hole course plays through tall native grasses, which contrast sharply with the manicured fairways and treacherous roughs. 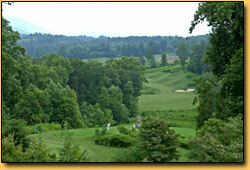 Brasstown Valley offers a full service Pro Shop, Driving Range, and golf lessons are also available. All within a short drive from the moutain property. The Towns/Union County area of the North Georgia Mountains is a hiker's paradise. 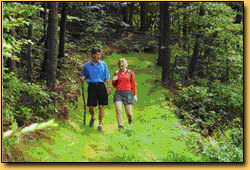 There are hiking opportunities, with difficulty levels ranging from easy to very strenuous - something for everyone. The Appalachian Trail, which stretches from Springer Mountain in Georgia to Mt. Katahdin in Maine, runs through a portion of Towns and Union Counties. Located just 108 miles Northeast of Atlanta, nestled in the Southern Appalachian Mountains, you will find one of the best kept secrets in the fly fishing industry. Located on the banks of Lake Chatuge and the Hiawassee River and within close proximity of the Toccoa, Tallulah, Chatooga, and Nantahala Rivers, this area in N.E. 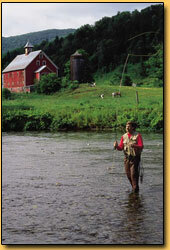 Georgia and western North Carolina is famous for its numerous year-round trout streams and rivers and is often compared to areas in the western region of the U.S. by experienced anglers. 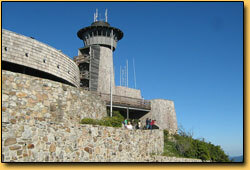 Enjoy access to year round boating, jet skiing, sailing and big lake activities in Lake Chatuge. Enjoy the many other lakes and rivers in the area. 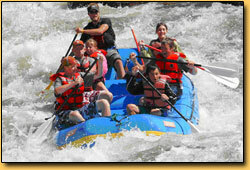 Whitewater rafting is a very popular attraction in the area. With several rivers and rafting outfitters to choose from, you will be assured of selecting the adventure and level that is suited for you and your group. Description: Physical address is 3499 Hwy 76 (Ridges Resort Marina) - Dock D. Call for reservations. 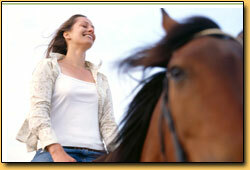 Horseback Riding is one of the favorite recreational activities in these mountains and valleys. With thousands of acres of woods, streams, valleys and meadows to traverse, no matter what your age, there is something very powerful about experiencing the beauty of these mountains from horseback. Description: The Stables at Brasstown Valley Resort features more than 5 miles of guided interpretive horseback riding trails. The horses at The Stables go through an intensive trial time by our Stable Master James Bradshaw, to insure that each horse has an even temperament and is well suited to riders both experienced and inexperienced. The Stables also offers pony rides for children and has boarding platforms for those guests that are physically challenged. The area has an abundance of Art Galleries displaying and selling local area artists� original works. In addition to major restaurant chains and family-owned restaurants, guests may also enjoy fine dining experiences, supper clubs, quaint coffee caf�s, choice steak houses, charming bistros, or quick service food. Antique stores display the work of many well known painters, potters and sculptors, along with a colorful array of Appalachian folk art. The North Georgia Mountains is the place where serious antique shoppers can spend hours or days browsing through a growing number of shops and antique malls. Streets are dotted with unique specialty shops, galleries and eateries from one end to the other. You can furnish a mountain cabin from top to bottom with period antiques, mountain furnishings and handmade twig furniture in the blink of an eye. There are six movie cinemas showing new movie releases. Many have matinee and senior discounts with private group showings available and free children's Saturday morning movies. North Georgia's favorite Family Fun spot is Fun World at Fieldstone. There you will find something for everyone in the family! At Fun World you can have a fun and safe experience with great games and fantastic pizza in a wholesome family atmosphere. The Georgia Mountain Fairgrounds plays host to several popular annual events including the Georgia Mountain Fair, the Georgia Mountain Bluegrass Festival, the Rhododendron Festival, the Hiawassee Festival of Arts, the Superstar Concert Series, the Georgia Mountain Fall Festival and Georgia's Official State Fiddler's Convention. The Georgia Mountain Fairgrounds are located along the shores of beautiful Lake Chatuge in Hiawassee. The Fairgrounds offer a wide-variety of unique venues, and beautiful year-round camping facilities. Scattered all along what is quickly becoming the "wine belt" of Georgia, from Milledgeville in the middle of the state and stretching up to the mountains of Dahlonega, North Georgia's gold-mining city, there are many active wine-making women entrepreneurs who envision a promising future for Georgia's wine country. GeorgiaWineCountry.com is devoted to Georgia's growing wine tourism industry and covers many of the things to see and do in Georgia Wine Country.